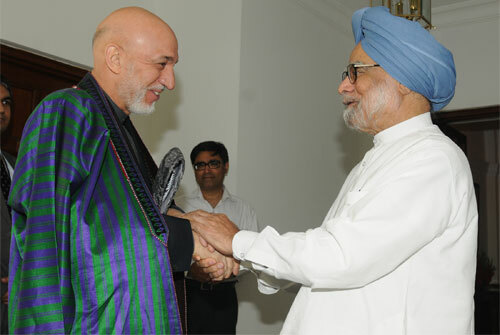 President Hamid Karzai of Afghanistan calling on Prime Minister Dr. Manmohan Singh, in New Delhi. PM's address to the Nation As I leave office, my abiding memory will be the love and kindness that I have always received from you. I owe everything to this country, this great land of ours where I, an underprivileged child of Partition, was empowered enough to rise and occupy high office. It is both a debt that I will never be able to repay and a decoration that I will always wear with pride. PM's address to the Nation In the last ten years, we as a country have seen many successes and achievements that we should be proud of. Today, India is a far stronger country in every respect than it was a decade ago. I give credit for these successes to all of you. However, there is still vast latent development potential in our country and we must collectively work hard to realize it. PM's address to the Nation Today, as I prepare to lay down office, I am aware that well before the final judgment that we all await from the Almighty, there is judgment in the court of public opinion that all elected officials and governments are required to submit themselves to. Fellow citizens, each one of us should respect the judgement that you have delivered. The just concluded elections have deepened the foundations of our democratic polity. 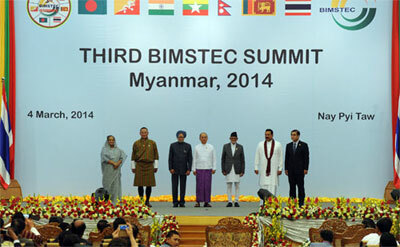 The President of Myanmar, Mr. U. Thein Sein receiving the Prime Minister, Dr. Manmohan Singh, at the opening ceremony of third Summit of the Bay of Bengal Initiative for Multi-Sectoral Technical and Economic Cooperation (BIMSTEC), at Nay Pyi Taw, in Myanmar on March 04, 2014.